Thank you for all those involved in this year’s Festival. It was a great succes Here are few videos of the festival made by Tempa la. enjoy in the side bar. 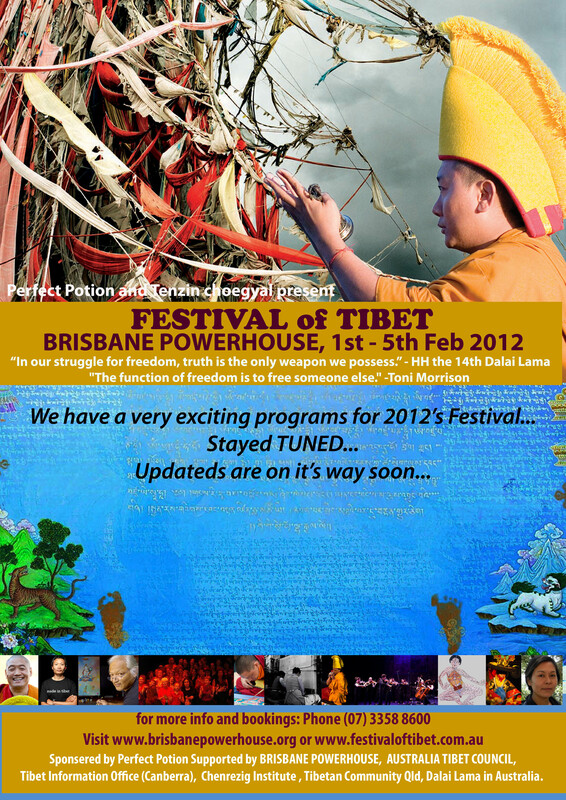 In its fourth year, sponsored by Perfect Potion and supported by Chenrezig Institute, Brisbane Powerhouse, ATC, Qld Tibetan Community and Dalia Lama in Australia – the Brisbane Festival of Tibet offers five days of Tibetan culture where audiences can participate in Tibet’s unique, philosophy, arts and way of life. The Festival celebrates Tibetan heritage, founded on the principles of compassion and non-violence, while addressing the issues which continue to threaten the future of Tibet. We are committed to ensuring the world heritage of Tibet is never lost or forgotten.